Rockstar Games have today unveiled The Millionaires Club, a new addition to the Social Club. The club recognises all players who have earned over 1 million dollars in the game - not based on your current bank balance though, but by the total amount of money you have made since you first started playing, i.e. every mission you passed, all money you picked up off the ground, every race you won etc. Once you've amassed a seven figure wealth, you'll be able to compare youself to all the other Millionaires out there. A total of three leaderboards show you who were the first to become millionaires, who did it the quickest, and who is the richest. Let us know how you've found the Social Club to be and if you're in the club already. I for one have had not such a good experience. Despite 100%'ing the game weeks before the competition deadline (sometime back in early-mid May), my status still to this day has not updated itself, and claims I've only completed the game 90 percent. Hopefully you've all had better experiences than myself! This news coming somewhat as a surprise to me, and I'm sure many others. 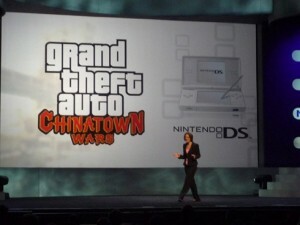 But no this isn't April Fool's, Nintendo have indeed just announced GTA: Chinatown Wars for the DS at this years E3 event. It's expected to be released this winter. Once again we'll see a GTA game taking place in Liberty City, though this one of course (presumably) focusing just on the Chinatown district. "This is a game that will deliver a rich, fast-paced and intense 'Grand Theft Auto' experience that will be truly unique to Nintendo's handheld platform," said Sam Houser, Founder of Rockstar Games. "Rockstar Leeds, along with the team at Rockstar North, has built upon a decade of progressive design on Grand Theft Auto, and has created something fundamentally fresh and immersive." Let's hope it improves upon GTA Advance! This news post is being updated with more info as it becomes known. Yes, you did read that title correctly. Brotha, who probably doesn't need an introduction now, gained fame in the GTA community for his amazing recreations of GTA IV trailers using San Andreas. Well, he's been up to his old antics again, and this time has recreated the first teaser trailer for GTA IV in... GTA IV. Not as easy as you may think actually since it's quite difficult to get some of the angles used, and unfortunately he doesn't have a capture card and had to make do with a camera, nonetheless, Brotha did his best and has produced another excellent video, see it below. Was the original teaser too long ago for you to remember? Fear not, here are some links to Brotha's previous works as well as one to the original teaser trailer for GTA IV.